Why “upper body” players have a decided advantage when it comes to repeating a smooth and accurate swing with every stroke! The lower body adjustment one pro PGA tour player picked up just by watching a video of a golf clinic Moe gave at Brevard Community College in Florida! Two little-known reasons why Moe Norman was the best ball-striker in the world. A simple exercise Moe practiced as a kid for 5 to 10 minutes at a clip (he demonstrates the position) that ingrained in his muscle memory the perfect spot to place the club so it stays on plane! Another mistake of the modern swing that throws everything off kilter and usually ends up in miss hits! The one secret to developing the “Feeling of Greatness” with every club in the bag! (Get this part of your swing right and it’ll transform you from a frustrated “duffer” into a… Master Of The Golf Swing From Anywhere On The Course! The bizarre technique Moe used for hitting wedges! Who is the best wedge player Moe had ever seen? You won’t know this one… but… the answer will shock and surprise you for sure! How he got the nickname “Pipeline Moe” during the 1957 Canadian Open! The Biggest Secret In The Game Of Golf! Three of the most important factors to a swing that is a thing of beauty! What to “say” to a hooked shot that gets away from you! How conventional swing mechanics prevent you from repeating a solid swing… and for the most part… give you the opposite results you want! This extra special video is a compilation of footage of Moe during various clinics and interviews. You get an insider’s view into the life and times of the greatest ball-striker to ever play golf. Moe shares his philosophy on how to play golf and win. You’ll see him teaching his unique swing and brand of golf to adoring fans. I’ll tell you, watching this video is like taking a walk down the memory lane of Moe’s life. 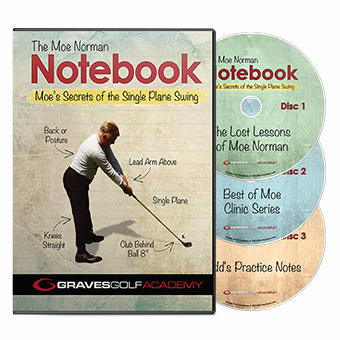 It’s a must-have addition to your golf video library. For the better part of 11 years, I studied and practiced with Moe. My game improved radically as a result. I started smashing 275-yard drives with ease. I practically never missed fairways and greens in regulation. And I became a true “plus handicap” player with numerous under par rounds in tournaments under my belt. All this time, I kept a written diary of the most important elements to Moe’s Single Plane Swing. These secret notes have never been shared with anyone. As part of this special offer, I shot a video based on my notes explaining the mechanics of Moe’s swing in step-by-step fashion. This is your fast track to developing The Feeling Of Greatness in your swing. 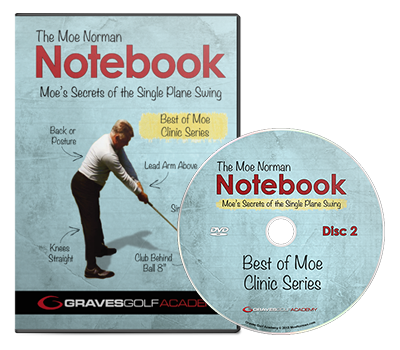 The video captures me showing you the 14 essentials of Moe’s swing. Everything from the address position… to the backswing and transition… to the downswing, through swing, all the way to the finish and everything in between. If you watch the video… and practice along… then… you too can become what Moe called a “365-day” golfer. In other words, one of the very few golfers in the world who can hit the ball with consistency day after day. This will change your game for the better forever.